Good location, clean, excellent value. The 60-room Quality Suites Houston is three miles from the George Bush Intercontinental Airport and provides affordable accommodation for both the business traveler and vacationer. Items included with the room rate at this three-story hotel are an airport shuttle, a deluxe continental breakfast, high-speed Internet access, local telephone calls, a newspaper on weekday mornings, in-room coffee and parking. There is one meeting room available for business or social functions that can accommodate 35 guests. The property has easy access to both Interstate 45 and 59. Area landmarks and attractions include the Houston Zoo, the Six Flags SplashTown water park, the Sam Houston Race Track and the George R. Brown Convention Center. Space Center Houston, home of astronaut training and Mission Control, is a 30-minute drive from the hotel. All the suites have a work desk with high-speed Internet access, television with cable movie and news channels, telephone with voicemail, refrigerator, microwave oven, coffeemaker, iron and ironing board, hairdryer and a separate living room and bedroom. Two-room suites and suites with whirlpool bathtubs are available. 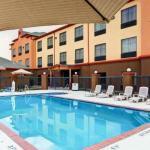 Handicap accessible and non-smoking suites are also available. This hotel has an outdoor swimming pool, hot tub and a fitness center. The complimentary breakfast is the only meal served here. There are several restaurants nearby including a Dennys, Jimmy Gs, McDonalds, Wendys, TGI Fridays and an Outback Steakhouse. The 24-hour front desk has information on area events and attractions. Other amenities include a business center with copy and fax machines available for guest use, daily housekeeping and ice and vending machines. This Quality Suites hotel is in an idea location close to the George Bush Intercontinental Airport and only minutes from several of Houstons major attractions. The suites here are spacious, well equipped and reasonably priced. These are some of the reasons that attract travelers back to this hotel which boats a team of efficient and friendly employees determined that all guests should have an enjoyable stay. Many clients enjoyed the complimentary breakfast and had no problem recommending the property to others.